Splatoon may well be the most interesting game Nintendo has created in many years, a project it seems – to me at least – that the Tokyo publisher has been working up to for quite a while. It’s casual yet intense, colourful but deep, a game that defies you not to smile. So far, so Nintendo. And yet, it’s different. Disarmingly so. Enter the squid kids, better known as Inklings, and Nintendo EAD’s first original characters since Pikmin. These strange avatars seem to be solely obsessed with battling and…fashion. For me, these are the two things at the game’s heart, neither being words I’d normally associate with Nintendo. Indeed, when you start up Splatoon it immediately feels fresh and vibrant, the Shibuya-like plaza a genuinely cool mix of The World Ends With You’s style and the wacky shop owners of Animal Crossing. Inklings wear chunky caps, bright kicks and beefy headphones to show of their ‘fresh’ style – in fact, until you reach level four, the shopkeepers won’t even serve you because you’re not street enough. Adding to this motif is the game’s ‘cool-kid’ attitude that hits you as much as soon as you switch it on, full of fat guitar riffs and glowering teenage expressions; it almost feels like something Sega would have made for the Dreamcast, and that’s most definitely a good thing. 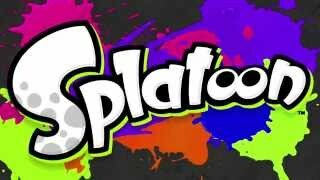 In terms of gameplay, Splatoon is Nintendo’s first foray into the world of online shooters, and needless to say they’ve taken the genre in a decidedly unique direction. Many gamers have often wondered what a Nintendo shooter would look like, and even though Splatoon learns some tricks from its big brother competitors such as Call of Duty and Halo, its core mechanic swaps the whole genre on its head: namely, the fact that killing or ‘splatting’ isn’t the order of the day. The main competitive mode, Turf Wars, is an online-only four versus four battle mode, and the main aim of the game is to simply cover more ground in paint than your enemies in the allotted three minutes. This simple change, from violence to messiness, is classic Nintendo. Your Inkling is kitted out with a Super Soaker style weapon, each of which are based on shooter classics such as the rifle or the shotgun, and they all distribute paint in different and thrilling ways. My favourite of which is the roller – which I suppose is one of the weapons that feels distinctly unique – and allows you to simply cover a ton of turf by running your huge paint roller over everything and everyone. Although I said ‘splatting’ your teammates wasn’t the main goal, it still comes into team tactics and can be useful to get rid of an opponent and reclaim some territory while they respawn by their base. For me, this allowed for stress free battles where I wasn’t worried about kill/death ratios or any meta game, but simply enjoyed what I was playing. It’s still chaotic and absolutely mad, but feels focused on fun first with leveling and stats second. I think this makes perfect sense when you consider that this is a game developed with kids in mind first, a gateway into the world of competitive shooters. As such, I also understand – and even applaud – Nintendo for keeping voice chat out as the norm, allowing for toxic-free gameplay, but it would have been nice in this day and age for there to be a ‘friends only’ option there for those who wanted it. Still, I found that I hardly missed voice chat with the simple to learn yet hard to master mechanics perfect for visual teamwork (the gamepad’s map, too, makes it easy to spot where team mates are and what areas need the most attention). The only real downside to the short and addictive just-one-more-game battles of Turf War is the fact that you can’t change loadout during matchmaking, which can be slightly irksome if you find out you’re going to be in a team where everyone has the same weapon. However, in my experience the matchmaking did a good job of mixing ability and weapon types so this isn’t a huge issue, although the fact you can’t duck out of matchmaking if you’ve chosen to play the next game is slightly more annoying, but hopefully we’ll see this patched in a future update. As I said, Turf War is an absolute blast, but I did find it a little shallow at first. However, the more time I put in, the more I realised how important tactics were. Whether it was equipping yourself sensibly with your freshest clothes, each with passive stats such as using less ink, travelling faster through the paint etc., or knowing when to transform into a squid, which allows you to travel through ink unseen and recharge your paint. As stated above, the gamepad’s map is also incredibly important as many games I played came down to less than 1% difference of covered turf between the teams, so every drop of ink became crucial to victory. Once your Inkling reaches level ten, you also unlock Ranked Battle in which a smaller zone of the map is contested; if your team is in control of it, a timer will tick down to victory, but if the enemy takes hold, their timer will tick down in turn. First team to get down to zero seconds wins. These games are tougher and far more tense than Turf War, and crueler too, gaining you no experience if you lose. Winner takes all, y’all. Unfortunately, there are no other online modes as yet, and only five stages on the disc (with another two having released for free since launch) – but even so, for an online-focused game, things feel a little thin. Nintendo have promised at least two more modes and maps coming for free over the summer months, so hopefully Splatoon will continue to expand in meaningful ways. It’s also a little annoying that you can’t choose which map you play on, instead one of two is randomly selected, which swap every four hours. Even having all maps being available while still being random would add to the variety, and hopefully this will become an option soon too. 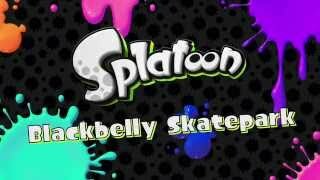 Still, Nintendo seem committed to adding to Splatoon, and on top of the fantastic maps already available, I’m looking forward to playing the new ones as and when they drop. The one plus side to this strategy is that the game will continue to feel fresh as new content is added, and it allows the community to grow with the game rather than people overplaying everything and getting fatigue early on. After all, Nintendo will want to secure a lasting community for Splatoon and this strategy may help them with that. Elsewhere, there’s an offline competitive diversion in the one versus one Battle Dojo, in which you have to pop more balloons than your opponent, but this feels very much like a throwaway and there simply to tick a local battle mode box – the meat is most certainly in the online games, that’s for sure. And rounding out the package is the surprisingly interesting and robust campaign mode. Hiding under a manhole cover in the corner of the Inkopolis plaza is a mysterious old geezer known as Cap’n Cuttlefish. Follow him through to Octo Valley to take on the nefarious archenemies of the Inklings, the mysterious Octarians. The single player mode features five ‘worlds’, each with an interesting boss at its end, the last of which is worthy of the campaign alone. The levels play out as short, liner affairs similar to Mario Galaxy levels as you ping from one area to the next, zapping Octarians and rescuing Zapfish. Yep, zapfish. These levels are at their best when they introduce one new idea such as inflating cubes or propeller powered platforms and then swiftly moving on to the next thing. I was surprised at how much I enjoyed the campaign, but it’s definitely an extra, and not the main reason to play Splatoon. Still, I’m glad it’s there, and perfect for a lazy Sunday afternoon. Plus, the secret collectibles offer a surprising amount of lore for such an outlandish game, revealing the fact that, Judd – the inexplicable bowtie wearing cat who judges the battles – was actually frozen for 10,000 years by his human owner in the hope of a better future; it seems that in Splatoon’s world we’ve been all but wiped out. 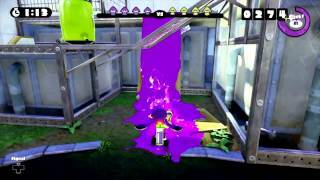 All in all, I think Splatoon is easily the most original game Nintendo have released in quite some time, and despite a few niggles it truly manages to capture that ‘one more game’ feeling that so many shooters and online games strive for. It’s pure, simple fun, and something I see myself ‘dipping’ into again and again over the coming months. A slick, fresh art style that is colourful and bold without being cloying in any way. You can almost smell the chemical waft of the neon paint. A decent campaign, and certainly worth playing with some inventive moments, but not the main reason to give Splatoon a whirl. A joyous, unadulterated blast – manages to capture that frenetic craziness of Mario Kart, whilst still being accessible to all, yet hard to master fully. Smooth and slick throughout, very occasional issues with matchmaking. A new Nintendo classic. Splatoon is an artistic and competitive triumph that demands you play ‘just one more round’ again and again. Splatoon is ranked #67 out of 1434 total reviewed games. It is ranked #2 out of 110 games reviewed in 2015.